Government programs without participation from the beneficiary community often run the risk of being removed from ground realities and becoming unsustainable in the long run. NGOs play an important role in precipitating the much needed participation from these communities. Where government programs are not forthcoming, NGOs often help organise communities and empower them to change their own circumstances. 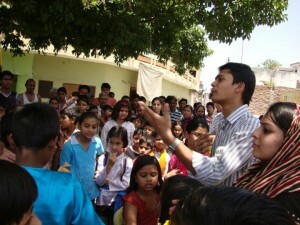 The segment on NGOs gives participants an opportunity to understand how NGOs work. It also helps them understand how NGOs collaborate with (and sometimes push) governments to achieve goals that they are passionate about. External speakers with rich expertise in not-for-profits are invited to share insights on community mobilisation, fund raising, campaign management and impact measurement. We also discuss the limitations of the NGO model and identify issues where NGOs have proven to be more effective than governments.